When Americas top companies book Dueling Pianos for their events they look no further than Americas foremost producer 2 Grand Entertainment. Producing shows for renowned clients such as: Microsoft, Apple, LinkedIn, Face Book, Yahoo!, NBC Universal,The Sharks, The Angels, Yelp, Time Warner, Maytag, Kraft, The Children’s Miracle Network.. (To name a few) Our all request, audience participation shows promise to provide our discerning clients with an unforgettable night of entertainment. Our turn key show is available for Corporate Parties, Fund Raisers, Weddings, Team building events, etc.. You dream it and we can make it happen! Best part of the night! 2 Grad Entertainment has been providing entertainment for our company Holiday party for several years now and let me tell you the make the party so amazing every year. The entertainment provided by 2 Grad Entertainment is professional, fun, and energetic. When our coworkers are getting ready for the Holiday party, they look forward to the entertainment by 2 Grand Entertainment more than any other part of the event. Wow what a show!! Michael was wonderful to work with and my group had a blast. I have heard many different dueling piano groups and this was by far the best. Great crowd interaction and all the requests were met. I would highly recommend 2 Grand Entertainment. Thanks for the quick reply and fantastic review!! We are humbled and yet proud that we are the best group you have heard of many. We try our best to keep our standards high. It was a pleasure working with you. Looking forward to working with you again in the future. These guys were great! They were on time, professional, accommodating of our requests and a slightly different format for their performance time frames, and most of all they got a normally low key crowd to interact and have a great night. Their performance was lively and very fun, and both performers were extremely talented. I would without a doubt use them again and highly recommend them! We hired this company to be part of the entertainment for our Holiday party. They were great to work with, very professional during the planning process, quick to respond. Their performance was definitely the hit of the night. Everyone had great things to say about them, they all had a great time, the performers knew most of the songs requested, they got the audience involved and never lost any energy during the 4+ hours of their shift. I highly recommend them and will use them again! Thank you Jade!! We also look forward to performing for you again next time. California Dueling Pianos performed for the first time at the Gilroy Garlic Festival. They were quick to get the audience involved and entertained. They generated a lot of tips from the crowd, which they generously donated back to the non-profit organization. We received positive feedback on the new act at the festival and will definitely consider having them back again next year! Fantastic and Easy to work with! Can't say enough good things about Michael and his fellow piano player. My only regret is not being able to keep them longer at the party. They were prompt (even in the hot sun) efficient about setting up and the final look and sound was fabulous. HIGHLY recommend them for any events as they appealed to our all age group crowd. From the very beginning, working with Michael from 2 Grand Entertainment was a breeze. He was prompt in responding to all our questions, flexible in working within our budget (quite small for a 35 person wedding), and very professional in working "behind the scenes" to iron out some struggles we were having with the venue. Although Michael himself was unable to perform at our wedding, Van and Bonnie were clearly two Vegas dueling piano pros! They were incredible and we couldn't have asked for a better duo to get our (very small) crowd going. Our guests were talking about the pianos for days after. Of all the choices we had to make in planning our wedding, the best decision we made by far was to have dueling pianos at our reception and to use 2 Grand Entertainment. Half the price of any Vegas dueling piano vendors we found, with 100% class, professionalism, and a great time had by all!! We hosted a dueling pianos event for our Alumni & Reunion Weekend guests at our small, liberal arts college in PA. What an incredible evening! The musicians were top-notch, interacted beautifully with our crowd that was diverse in age, and kept the energy level high and upbeat until the very end. The process from booking to follow-up after the event was efficient and quite professional. This was a versatile show that would be appropriate for a variety of venues and audiences! We used 2 Grand as our entertainment for a Mother and Daughter luncheon for about 500 women of all ages. They did a great job of hitting many different genres, and generations to make all the ages feel included and enjoy the experience. I had several ladies tell me this was their favorite year at Mother Daughter because of the dueling pianos. The group is easy to work with. They set up everything, include their own sound equipment and will customize the experience to your radiance. We enjoyed them thoroughly and highly recommend them! The dueling pianos at our company party were an outstanding addition. It was a great way to get people involved and keep them entertained. We would recommend them to any looking for a fun unique experience. Kept Us Moving on Chilly Vegas Evening! 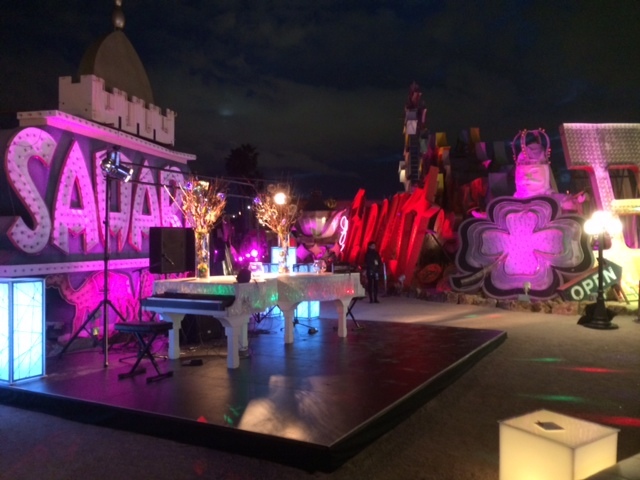 2 Grand Entertainment played at our corporate event on March 3, 2015, in Las Vegas. It turned out to be a pretty cold evening and they were troopers! They really kept the party vibe going despite the chilly weather. We were really happy with how their playlist fit our party theme and then when things really got going, they played current music. These guys do not disappoint! Thank you Denise! You were so much fun and you sure know how to put on an amazing party! We contracted 2 Grand Entertainment to do a dueling piano performance after dinner at our Users Conference and they also played during dinner. We could not have been more pleased. They put on a fun performance, were easy to work with and adapted to our crowd very well. Overall a great performance. These guys were the entertainment for our company holiday party and did a great job. The crowd was a little hesitant at first but they got them warmed up soon enough and by the end people were performing Grease, Rocky Horror Picture Show and so much more. I would highly recommend if you want to liven up a party. Let me just say, AWESOME! I first called Michael to inquire about the show and was excited to hear what they could provide. Being a party planner for our entire company is difficult because of all the different age groups and personalities. 2 Grand Entertainment well exceeded my expectations. In past years our guests ate dinner and left. Almost everyone stayed until the end of the night. Everyone, LOVED the show. It was fun to see people get involved with the music and interact with the performers. I was fully impressed, as was our entire company. It was professional and a super solid experience for myself and everyone else. Thank you, Michael. People said it was the best party they have ever attended! The dueling pianos never cease to pack the house at our large entertainment events on board the Queen Mary in Long Beach. They are so professional with a great repertoire. Whether entertaining in our intimate Jazz club setting or performing in our massive Grand Salon, these guys know how to put on a show that keeps people cheering for more. Thanks for another solid show! Thanks for the awesome review! We always look forward to ringing in the new year aboard the Queen Mary!! Wishing you a wonderful 2105!!! I can only speak for John Crampton, who played at our event. He is great. Wonderful player and singer, and I was instantly comfortable with him as soon as he showed up and introduced himself. He was flexible in terms of repertroire, knew when to engage with the crowd, and when to hang back, and was a consummate professional. Everyone loved the music, and he just did everything right. I'd hire him again in a second for any type of event. Thanks John! He ain't cheap, but totally worth it! Michael and his partner were awesome at our corporate reception in Las Vegas last week. Everyone had a blast, music sounded excellent, songs were great, and really enjoyed the humor! I recommend Michael for any event and would certainly work with him again in the future. Thanks and have a great holiday! Fantastic Entertainment for Our Holiday Party! Thank you for all that you did! Everyone had a blast! Michael and his partner were absolutely mind-blowing and fun! I hope we can schedule for another event in the future. Great voices, great songs, knowledgeable, fun, easy to work with! Thanks again and Happy Holidays! 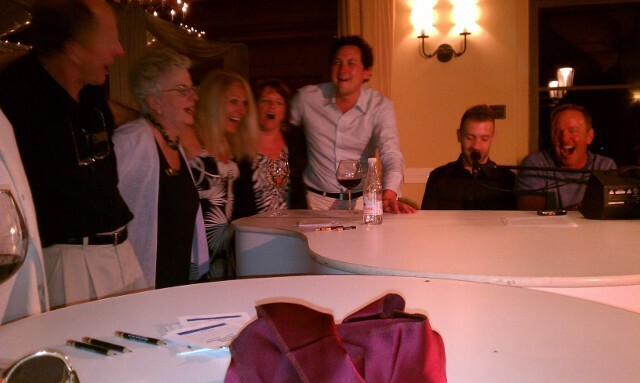 We hired the Dueling Pianos for our conference's banquet and they were great entertainment! We requested them to include special key-terms (jargon relevant to our group) in the songs and they did so willingly and wonderfully. I would highly recommend them! We host a cooperate event twice a year with 500 of the top Realtor's and Lenders across America. During our Thursday night dinner, we have entertainment come in. The California Dueling Pianos were a HUGE hit. They were interactive, funny, entertained the audience and did everything they were requested to do. Not only was their act great, they also helped redeem the night from a comedy act that failed MISERABLY! They took over the stage and ended the night on a high. I would HIGHLY recommend these guys to anyone looking for different entertainment for a cooperate event and we will have them back soon! The are of the dueling pianos is literally in good hands with the gentleman at 2 Grand Entertainment. They know how to play, they have a wide repertoire of songs to choose from, and most importantly they know how to engage an audience. I've seen them perform twice now at two large scale events (one of which I hired them for) and each time they turned what could have been standard ambient background music into a party-wide participatory affair! I wouldn't hesitate for an instant to hire them again. My bride and I booked 2 Grand Entertainment as our Music for our wedding. The played all music requested for the ceremony, and provided the p.a. system! The communication leading up to the big day was clear concise and responded in a timely manor. The show was AWESOME! fun engaging, and professional. The look of the equipment, the professionalism couldn't be matched will a simple DJ. I would recommend 2 grand for any and all events big or small, They bring the energy, fun, and an unforgettable experiance!!! Thanks for the honor of being chosen to provide the music for your ceremony and entertainment for your reception. It was an amazing event!! The Grand was a beautiful choice of venue for your wedding celebration. Michael performed at our wedding and was absolutely fantastic. He did our wedding ceremony music, cocktail hour music, and a dueling piano show after dinner. It was both and enjoyable and easy to work with him (including a last minute change to the ceremony music the morning of the wedding)! Everyone had a great time and I strongly encourage you to contact him. Thank you Stacey! It was our pleasure. My husband and I hired 2 Grand Entertainment for our wedding on August 15, 2014 in San Rafael, CA. Michael took care of everything we needed in regards to music. From the ceremony, to the background music during dinner, cake cutting and performing his Piano Blast show for dancing. We have had many compliments on our choice of entertainment he was a big hit! He catered to the adults and children alike and played whatever songs were requested and many others we forgot to request. He also had a chest full of goodies that the kids loved from Boas to sunglasses. We would highly reccomend 2 Grand Entertainment for your next event! Amanda - Thank you for the wonderful review! I wish you and Kevin a lifetime of love and happiness!! More than your money's worth! If you're in need of some high-energy, interactive, memorable entertainment for your event, 2 Grand will deliver 200%! I hired them for a cruise on the Hornblower (Yelp's 10-Year Anniversary!) and they were a definite highlight of the event. Guests were singing, dancing, shouting, cheers-ing, and begging for more! Micheal and his partner in piano crime played for 3 hours straight! They arrived with plenty of time to set-up, and were totally self-sufficient from start to finish (as an event planner, this is priceless!) Best of all, they incorporated our event theme into their performance without me even having to ask. I felt that they were just as interested in making the event successful as I was, and that's priceless! FYI, they don't bring actual grand pianos, but keyboards with a very convincing grand piano facade... phew! So much easier for load-in. For corporate events, private parties, or any occassion that needs a boost of energy, I can recommend 2 Grand wholeheartedly! 2 Grand Entertainment put on a fantastic show! It was our first experience with hosting an event in our renovated bar/restaurant space, so it took a little finagling to figure out the best setup, but turned out great. Everybody had a great time, we look forward to booking with this company again soon! The renovation is amazing and your staff is wonderful. We look forward to coming back to the best bar on the wharf - Pier 2620 Hotel! 2 Grand played a corporate event for us at Tahoe the past week. They did a great show and everyone had a blast. Michael went above and beyond for me in booking the show...highly recommend. The custom pianos are so cool. Michael and his team are very easy to work with - extremely flexible and professional. Recently we engaged 2 Grand for an award event- they certainly made the evening a celebration!! First some good background music, then the "guys" involved all of us in a fun evening with their musical selections, responses to requests, and personalities. We can recommend them highly. Not only was the talent excellent, the voices awesome, and the music fun and upbeat, Michael was very accommodating in every way. He was responsive to requests, took charge of the timing of the event activities, and professional in every way. I would recommend this team to anyone! The entertainers were awesome to work with from the first conversation until after the event. They were professional and true entertainers. 2 Grand Entertainment did all the music for our wedding reception. We did two pianos and one drummer which started during the cocktail hour. They mixed a little DJ time with some live songs. They handled the party introductions; formalities like dances, dessert moment etc. and everything seemed seamless. After all the formal stuff, the dance floor was packed all night! They listened to the crowd for requests and mixed genres/age groups so well. I will never forget that night, the music, the dancing and would absolutely recommend them to everyone. Despite photos, sound clips, videos and even reviews, there is always an element of risk involved when selecting corporate entertainment (unless you have the budget for the big names). I took that risk with 2 Grand Entertainment for an awards afterglow event and won big. These guys had senior level executives from some very well known Fortune 100 companies singing and dancing the night away. 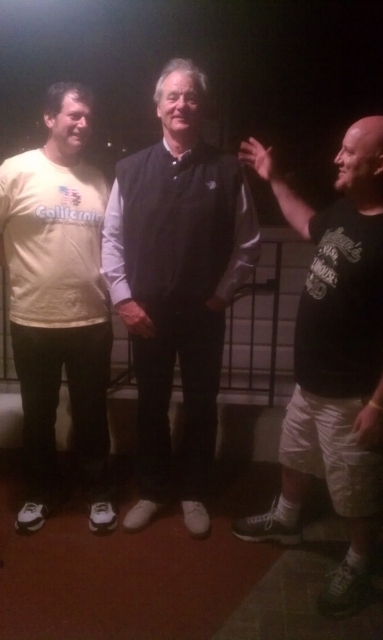 Even our owners got involved. If you're looking to add a new level of engagement to your networking reception or an afterglow event, I high recommend 2 Grand Entertainment. 2 Grand Entertainment provided a top notch performance for our group of about 80 guests. They took the time to get to know the crowd and gauge what would be appropriate ensuring that all guests had a good time. The performers kept things lively throughout the evening, engaging everyone who wanted to participate. They were quite talented and versatile! From a planning perspective, Michael at 2 Grand Entertainment was a pleasure to work with. He was responsive, flexible about the group’s needs, and took the extra steps to make sure the equipment would fit the venue. I felt confident that it would be a great evening from the moment we began talking. Below is a brief description of our company, show options and general pricing. Since you found us on GigSalad, I’m sure you will be bombarded with quotes, so I have also added some items to consider when hiring a traveling Dueling Piano show, which might help you make a better informed decision. If you have any questions or are ready to book please feel free to contact me any time. 2 Grand Entertainment | America's Premier Traveling Dueling Pianos Show Since 1993 | has distinguished themselves as the unique experience in the private party/corporate event arena. Producing shows for renowned clients such as: LinkedIn, Face Book, John Hancock, Cisco, Time Warner, Bank of America, Harrah’s, The Children’s Miracle Network (to name a few). Our all request, audience participation shows promise to provide our discerning clients with an unforgettable night of entertainment. With 2 Grand Entertainment we not only pride ourselves on performance but also presentation. We have the most experienced staff in the business. 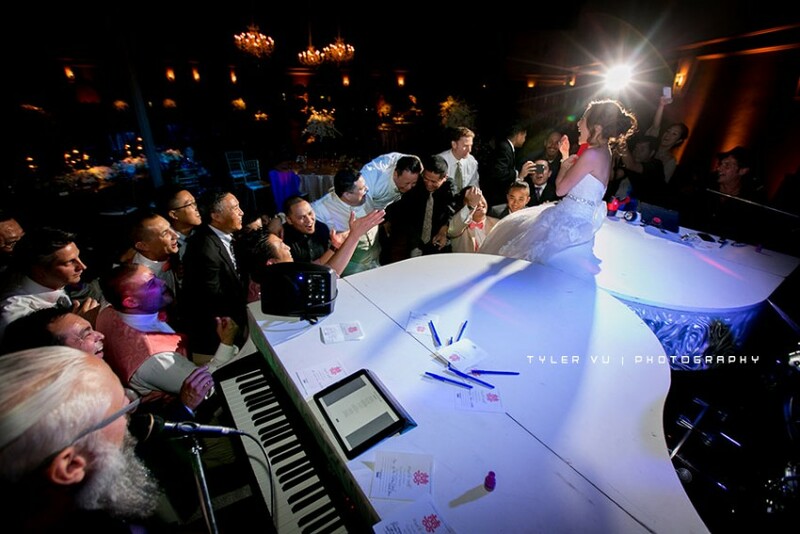 Our elite staff of hand-selected performers have at least 7 to 20 years experience in the Dueling Pianos industry, performing thousands of successful engagements. We are a turnkey operation supplying all the necessary equipment to produce a Dueling Piano Show. Our state of the art presentation includes: 2 Baby Grand Pianos, (not a couple of make shift keyboard stands like other companies provide), PA, Stage Lighting and of course 2 world class entertainers. No guess work on who's supplying the equipment. We have many show options to suit your entertainment needs such as Piano Blast, Dueling Pianos and Great Pianos. With this much variety we can tailor fit a package to fit any event and budget. Our show packages range from $2,000 to $8,000. Generally our Dueling Piano Show starts at $3,000 for a three- hour performance. We strive to make booking entertainment for your event as simple as possible. All we need is a time, date and location and we will take care of the rest. We perform shows nationally and internationally, (from Anaheim to Amsterdam) and have performers and equipment in various locations across the country to keep travel expenses down. For a video demo and more information please visit our website. Here are some things to consider when hiring a traveling Dueling Pianos Show. Are they licensed and insured? Any reputable company will be licensed to do business and carry at least $5,000,000.00 in liability insurance in case of any misfortune. I would be concerned about hiring a lounge player with little or no experience in Dueling Pianos. You will get two guys on pianos but with out the experience they do not know how to engage an audience. It is not a real Dueling Piano Show. I would also be concerned when hiring an act from a nightclub. Most commonly they send their less experienced “B list” players who have a limited repertoire and don’t know how to shift gears from nightclub mode to private party mode. Which means you might get two kids on their Casio’s, who only know a few pop tunes, getting drunk on the job, telling dirty jokes and offending your guests. There are some companies that act as, “temp agencies” that will send out any performer that is available just to make a commission. There are other company’s that can produce good shows. Things to watch for when hiring an act form far away are things like airplane/travel delays, (Make sure they arrive a day early!!) otherwise they might not show up on time or at all. Also when they do they might just bring keyboards on stands that don’t look so great and rent some discount PA system from a local DJ, offering poor sound quality and a less than a spectacular presentation. Also watch for hidden costs. For example some dueling piano companies might lure you in with a low quote of $2,000 then add on travel costs of $1,000, rent a car $150, Gas $75, hotel rooms $300, equipment shipping $600, PA rental $500 lighting rental $250. With our nationwide, turnkey operation our added travel expenses never exceed $500. When hiring act’s from Vegas. They do produce quality shows but tend to be way over priced just so you can say they are from Vegas. With 2 Grand Entertainment we not only pride ourselves on performance but also presentation. We have the most experienced staff in the business. Our elite staff of hand-selected performers have at least 7 to 20 years experience in the Dueling Pianos industry, performing thousands of successful engagements. We are a turnkey operation supplying all the necessary equipment to produce a Dueling Piano Show. Our state of the art presentation includes: 2 Baby Grand Pianos, (not a couple of make shift keyboard stands like other companies provide), our own PA system, Stage Lighting and of course 2 world class entertainers. No guess work on the quality of the performers and who's supplying the equipment. **We are more than happy to keep our prices competitive and we will match or beat any reputable company’s reasonable quote. Set the stage with two Grand Pianos and two outrageously talented piano entertainers. You have entered the world of the hottest entertainment act in the country. When you hire 2 Grand Entertainments Dueling Piano Show you'll get a world class Piano Duo, a night of comedy, Top Forty hits, oldies, dance tunes, and novelty songs all in one show. The all request show is a combination of sing a-long, comedic bits, dedications, dancing and most importantly audience participation. Request your favorite songs - American Pie, Piano Man, Great Balls of Fire, Brown Eyed Girl, to name just a few of the thousands of songs our piano entertainers perform. You can also request dedications, roast your friends for occasions like weddings, birthdays, bachelor/bachelorette parties, retirement, job promotion and anniversaries. We have a song for any occasion. The entertainment value of a Dueling Piano Show is the obvious choice when compared to bands or DJ's. With a band the audience dances or just sits there watching. DJ's just push a button on their i-pod. Dueling pianos has it all, live entertainment, singing, dancing, comedy, requests and the whole audience participating all night long. Want even more? Check out our Great Pianos Show. 2 Grand Entertainments Great Piano Show is the pinnacle of piano entertainment. Its like Dueling Pianos on steroids! Set the stage with 2 Grand Pianos, two outrageously talented piano entertainers then add the options of a drummer, percussionist, bass, guitar, live DJ, saxophone, backup singers, an exciting light show, big screens flanking either side of the stage, fog machines, confetti cannons. The sky is the limit!! This all request extravaganza is over the top. With all the elements of our Famous Dueling Piano Show and a full-blown stage production nothing compares to Great Pianos. 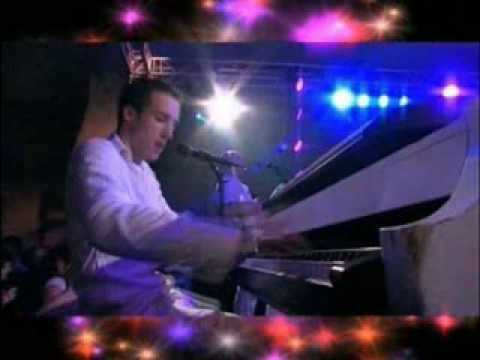 Great Pianos was developed in Europe where the humor and intimacy of our American style dueling pianos did not translate and turned it into an all request dance show. 2 Grand Entertainment is the first company in the world to combine our beloved Dueling Pianos sing-a-long format with the European dance version. This show begins with a traditional Dueling Piano Show steadily building to a crazy euro dance party climax. Still want more? If you can imagine it we can do it! 2 Grand Entertainment supplies all the equipment needed to put on a show. You supply the venue and Great Pianos will show your audience the time of their lives. Set the stage with one Grand Piano and one outrageously talented piano entertainer. You have entered the world of the hottest entertainment act in the country. When you hire 2 Grand Entertainments Piano Blast Show you'll get a world class Piano entertainer, a night of comedy, Top Forty hits, oldies, dance tunes, and novelty songs all in one show. The same format as our Famous Dueling Piano Show slimed down for events, which don't have the space or budget for a full-blown Dueling Piano Show. The all request show is a combination of sing a-long, comedic bits, dedications, dancing and most importantly audience participation. Request your favorite songs - American Pie, Piano Man, Great Balls of Fire, Brown Eyed Girl, to name just a few of the thousands of songs our piano entertainers perform. You can also request dedications, roast your friends for occasions like weddings, birthdays, bachelor/bachelorette parties, retirement, job promotion and anniversaries. We have a song for any occasion. You can also expand Piano Blast by adding a drummer, guitar or saxophone adding the extra element of an all request dance band. The entertainment value of a Piano Blast Show is the obvious choice when compared to bands or DJ's. With a band the audience dances or just sits there watching. DJ's just push a button on their i-pod. Piano Blast has it all, live entertainment, singing, dancing, comedy, requests and the whole audience participating all night long. This is a sample list of some of the thousands of songs you can request. We are always adding new songs to our repertoire so if you don't see your favorite song here don't worry. We might have learned it already or will be happy to learn it for you with some advance notice.